There is an insane amount of meat on a quail - and (around these parts) they are well priced. This is Karen's Pancetta/rosemary recipe - although not made here as well as she made them for us a while back. 1. Place a little oil in a baking pan. Preheat oven to 165 C (~330 F). 2. Rinse and inspect quails and remove any odd feathers etc. Dry quails. 3. Chop rosemary and mix with salt. 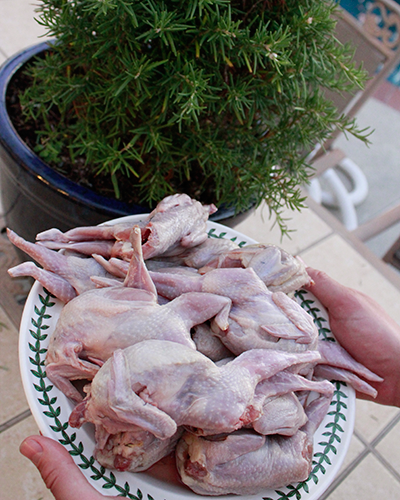 Rub inside and outside of quails with the mix, leaving some on the quail. 4. If you intend to stuff the birds, mix the stuffing ingredients and spoon or hand press into body cavity. 5. Wrap pancetta around each quail and secure with a toothpick. Arrange in pan and place in oven. 6. Cook quails for 50-60 minutes, basting every 10 minutes or so with red wine. 7. If quails are stuffed, they will need another 15 minutes or so to cook. 8. Serve with salad, roast potatoes and crusty bread.